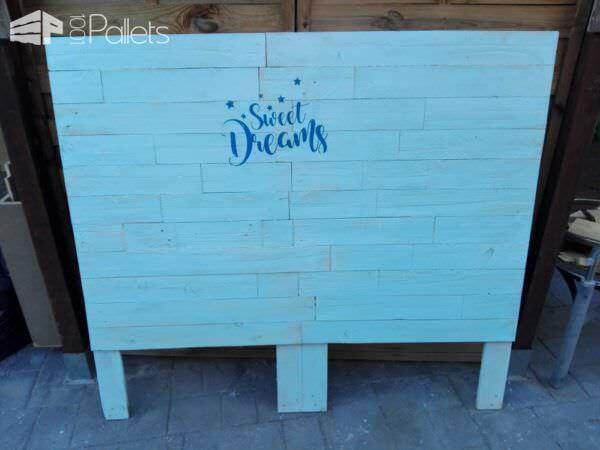 We created this Stenciled Pallet Headboard using three pallets. The headboard measures 150cm. 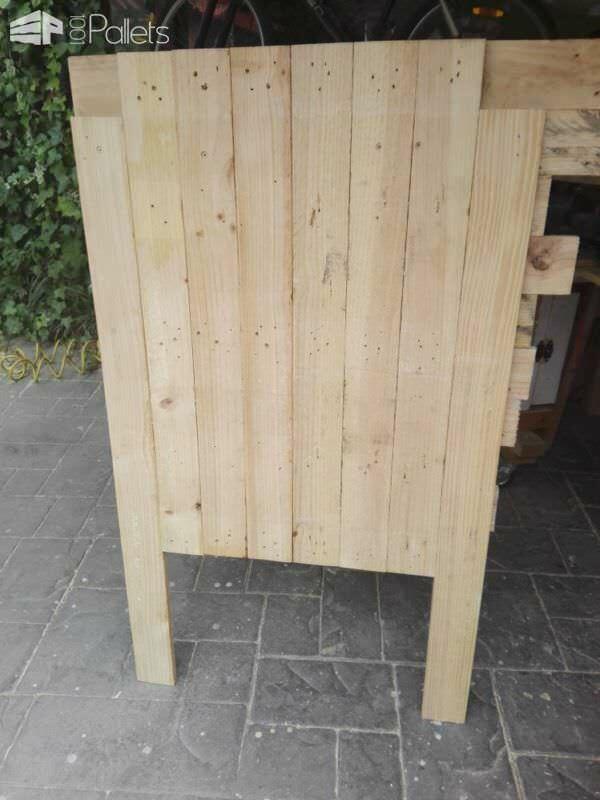 Usually, a headboard needs about 10cm more width, so we will think of making a head 160cm wide by 130cm high, which is already a considerable height. 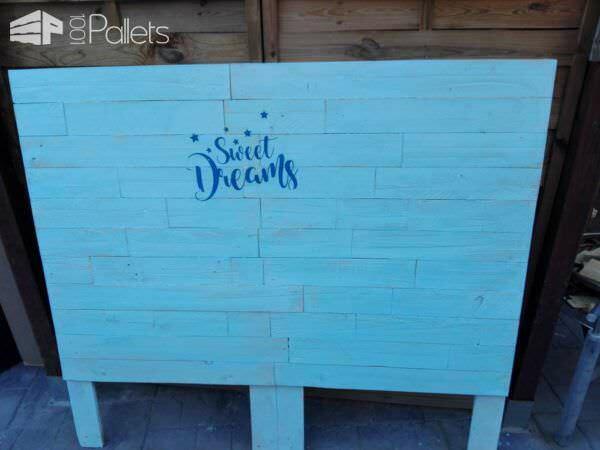 Have fun with a great stencil idea on your own Stenciled Pallet Headboard! 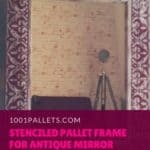 First, choose pallets that are in good shape if possible. 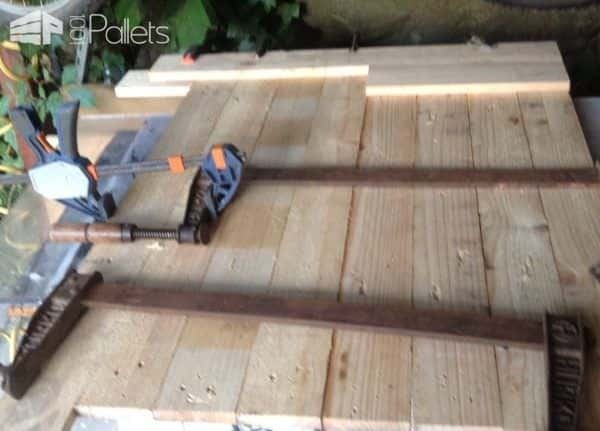 After disassembling the pallets, smooth the boards down with a sander or a planer. You may want to brush the boards first and then sand it later. We built this headboard with a double-thickness to make it more consistent. We arranged the wood grain vertically in back and horizontally on the front. Next, we trimmed the horizontal pieces to create a more consistent pattern and evenness. I came up with the idea to build the headboard in two pieces to make it easier to transport and then assemble on site. This makes the piece easier to stain, paint, or seal. The paint used is chalk paint with a sky blue tone and then sanded superficially so that the wood appears again in some places. Alternately, you could use a transfer technique too. The wood was glued and clamped together. 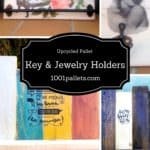 I made the pallet headboard into two pieces. This is the backside view. 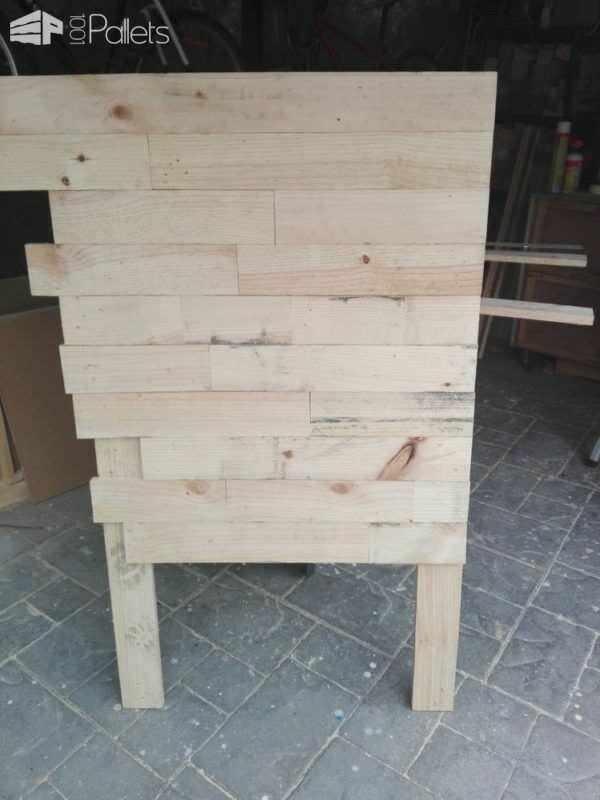 Front view of 1/2 of the headboard with the pallet boards installed onto it. 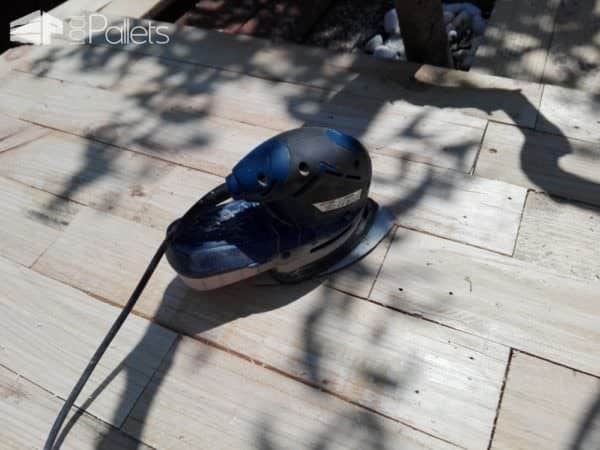 I used a planer to smooth the pallet wood after removing all the nails/staples.  Do touch-up sanding as needed after gluing and securing the boards onto your backer frame. Here is the completed structure without any stenciling yet. 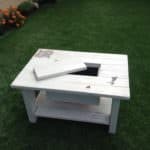 Add a stencil of your choosing, and then lightly sand to give it a slightly distressed look. Beautifully done! 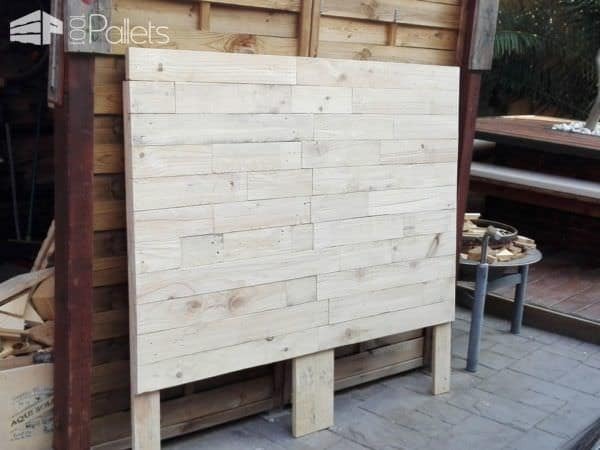 Now, how about a whole Pallet Bedroom Wall? Turn an old dresser into clever Under-Bed Storage!